﻿ Book Hotel Mountain Paradise (La Fortuna) - 2019 PRICES FROM $125! Have a question for Hotel Mountain Paradise? 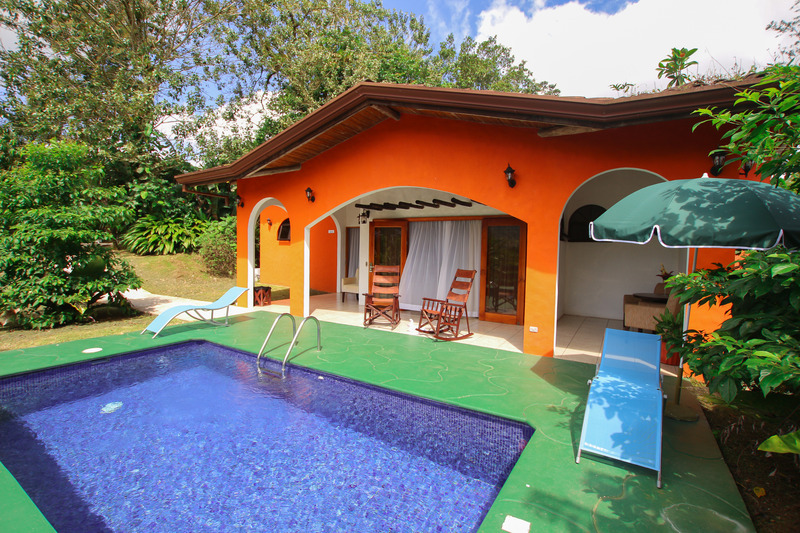 Ideal for fun and relaxation, Hotel Mountain Paradise is located in the Palma area of La Fortuna. Situated only 7.0 Km from the city center, guests are well located to enjoy the town's attractions and activities. With its convenient location, the hotel offers easy access to the city's must-see destinations. Hotel Mountain Paradise also offers many facilities to enrich your stay in La Fortuna. For the comfort and convenience of guests, the hotel offers free Wi-Fi in all rooms, Wi-Fi in public areas, car park, room service, airport transfer. The hotel features 46 beautifully appointed guest rooms, many of which include television LCD/plasma screen, separate living room, internet access – wireless, private pool, internet access – wireless (complimentary). The hotel offers an excellent variety of recreational facilities, including hot tub, outdoor pool, spa, massage, pool (kids). Whatever your reason for visiting La Fortuna, the Hotel Mountain Paradise is the perfect venue for an exhilarating and exciting break away. 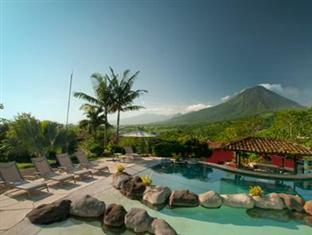 Amazing views of the volcano and a well maintained becautifuk property! The staff was super friendly and helpful at all times. They showed us the sloths in the trees next to our house or gave us an awesome snack at the bar for free. We had meals included and I was stunned about the quality and choice of food. We had the best steak in the evening. Our house was surrounded by a green garden with perfect privacy. It had a huge bathroom with two nice showers and the jacuzzi bathtub on the terrace, which we did not use unfortunately because we spend the time at the big heated swimming pool. I will come back for sure and recommend it to friends also. This was our first stop on our adventure across Costa Rica, and what a great introduction! The location is fairly good, although driving up the mountain, down unpaved roads and past cliffs for the better part of an hour would make anyone think twice about visiting Arenal, but i promise you, it was worth it! The hotel was located off a main road, just down the street from a few of the major attractions (about 15 - 20 minutes) and about 10 minutes from the city centre. You're surrounded by lush rain forest, and if you're lucky, the clouds may clear up and you'll get to see Mount Arenal while sipping cocktails by the pool. We had gone to Costa Rica in June, so we got a very good rate on our room. To be honest, I'm not sure if I would have paid the full 'high season' price for this place; not because it wasn't worth it, but mainly because I personally think no hotel is worth a $400 a night stay. I loved everything about this place. Doing research before the trip, it seemed almost too good to be true. When my boyfriend and I got there, we were completely blown away. It is exactly as shown in the pictures, only more beautiful and serene. 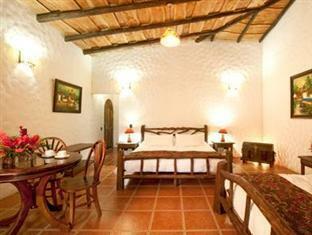 Each room is in its own private building which you can reach by a small, well lit path. We spent the first night getting delicious Tortilla soup in the hotel restaurant, and drinking wine while sitting in the private tub on our back porch. In the morning, after a delicious breakfast at the hotel buffet (which offers a little bit of everything) the hotel staff helped us figure out the best ways to get to all of the attractions we wanted to see and even called a cab to help us get there. There was nothing better than coming home from a long day of hiking and taking a LONG and relaxing soak in the waterfall shower, and then going out for a few drinks at the pool. While sitting at the pool bar, you have a perfect view of the Arenal Volcano. This was the first stop on our 2 week long Costa Rica vacation, but I would have been perfectly happy staying at Mountain Paradise the entire time. I cannot recommend this place enough. it was excellent...for the price it is way more than ever expected. Amazing view and very luxurious rooms. staff is very helpful in arranging activities in the area and provides transportation for free during certain hours...amazing pool side bar and pool is open 24 hours. The staff so friendly and easy to work with - eager to help. Our room was fantastic - big and roomy for a family of four. We had our own pool, which was a total surprise and just loved walking through the lush landscape. Breakfast was delicious and we found it to be a great place to start our vacation. View of Arenal Volcano, waterfall whoers, LARGE, beautiful rooms. We had a wonderful time here. The staff was very friendly and helped us in many ways. We spent two nights here in February. The staff was friendly and professional; the grounds are nice, the heated pool was attractive, the food was good, and the rooms (junior suite) are a good size. The two showers (one a waterfall, the other one had multiple spraying heads that created a mess all over the floor) are unnecessary to me and a pain to fool with. One normal shower head would suit me. We did not use the jacuzzi on the porch because the water was only warm and trickled in. As mentioned earlier, more interior lights are needed. Also, I wish the walls were a bit thicker or soundproofed: our neighbors talked loudly and had loud music on at 5:30 a.m. I complained to the front desk and no more noise! The things I mention were minimal; perhaps they are just a bit ambitious with their plumbing! The private suites were free standing building that were attractive,spacious, well deocrated and had great amenities.. The grounds were very attractive and well maintained and offered a great view of a volcano. Our private suite had a well equipped kitchen, a hot tub outside our bedroom, two good sized outdoor sitting areas and a shower with all possible options. The A/C worked well and was needed during part of the day. The pool was not that large, but more than adequate for the number using it. The breakfast was quite good, provided a large variety of prepared dishes and a number choices. Service was fast and responsive. The staff was warm, friendly, competent and responsive. Most staff spoke adequate English and some some fully bilingual. Our only reservation was that the quality of the meals at both their restaurants was disappointing. They were fine in dealing with basics, but their menu over promised in terms of specialty dishes. the hotel was beautiful and we especially enjoyed our private pool. Recently spent 3 nights at Hotel Mountain Paradise with our family of 6. They provided us with two rooms together, as we had requested. The rooms were big with very private terraces with hot tubs (which we actually didn't use, as the resort pool was so nice and the kids loved the idea of a swim-up bar and a tv you could see from the pool). The included breakfast was excellent with a large selection of foods (both typical Costa Rican and American). Every hotel employee that we had contact with was polite and gracious, and the service was very good. The only complaint I have is that the drainage in the bathroom was somewhat sub-par, with the shower backing up sometimes when we used it, and the sink actually backing up a little while the shower was running. This was a minor problem, however, and did not detract from our stay. We loved the private backyard of the room. It feels like there's only your room and the jungle. We had a junior suite and it had a private jacuzzi and 2 rocking chairs in the backyard, a huge bathroom with a regular shower and a waterfall-like shower. The staff was great. Awesome wet-bar: The guaro sour I had here was the best in the whole Costa Rica trip. This property is beautiful regarding the volcano view and plantlife. Heated pool was nice. 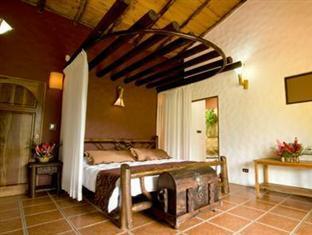 You are in close proximity to the local town, many restaurants, volcano, hot springs. Overall the staff was cordial except for the restaurant waiters. Watch out for the golfcart drivers! This hotel property is ideally situated. Rooms are large. The only difficulty was finding the proper signage off of the main road. Views, lovely rooms, good breakfast. We stayed at Mountain Paradise for 6 nights, and really enjoyed it. The room was spacious, with an attractive, king size bed, and a choice of two showers... we preferred the waterfall shower, it's a really nice feature. The hotel grounds are lovely, and all the plants and flowers attract lots of birds, especially humming birds. We had a frog outside our room one night, and some lizards would bask just round the corner or our room each day. We saw an iguana at the pool on the last day that we were there, and several times spotted a basilisk there as well. A blue and gold macaw came to visit one morning too. It's a good choice of hotel if you like wildlife. The spa bath on the terrace was nice, to relax in after our adventurous days, but unfortunately, it didn't work very well, and although the jets made the water move a little, they were not strong enough to make any bubbles, so it was more like a normal bath really. The power shower had four massage jets on it, but only two of them worked, which made it quite pointless to use. Very glad there was the waterfall shower as an alternative. My lamp also did not work. The staff tried to be attentive, but sometimes needed asking twice before things got done. The breakfast was good, but some days it was a buffet, and others it was a set menu. The worst thing about the place was the shuttle. It is supposed to go at set times, but we used it on three different days, and it never went on time. Also, it often took a detour, to drop off staff or guests at different spots, and once, when we were half way back to the hotel, it stopped at a supermarket, picked up some people (not sure if they were guests or not), and they wanted to go into town, so the driver turned round and when back into town, before taking us back to the hotel! Very frustrating when you have plans. The plus points definitely outweigh the negatives here, and I would not hesitate to stay there again. Found this luxurious property on the internet and was overwhelmed by it's charm and beauty. The rooms were spaciously designed to make you feel right at home with everything done first class. With 2 5 star restaurants, a delightful spa, elegant surroundings and a very helpful staff, who could ask for more. Would recommend highly to any one looking for a great hideaway.